Susheel Arora, Director of Wastewater and Stormwater Services, Halifax Water, oversees the utility’s wastewater collection, treatment and biosolids management. Halifax Water is a progressive utility that invests in leading research, employs advanced technologies and leverages industry best practices. Erin Mahoney, Commissioner of Environmental Services, Regional Municipality of York, oversees water and wastewater services for 1.2 million citizens and 28,000 businesses. York Region will be the first utility in Canada to adopt leading-edge wastewater treatment technology to produce high purity effluent. Stephen Stanley, Vice President, EPCOR Commercial Services, oversees business development and has been responsible for 50+ water and wastewater treatment facilities at EPCOR Water Services Inc. The company was recently recognized as one of Canada’s Best 50 Corporate Citizens by Corporate Knights. Singapore International Water Week from July 8 to 12 is a global forum for water leaders and practitioners to discuss leading issues, trends, opportunities and solutions. This year’s discussion will focus on smart systems, water reuse and advanced treatment technology, and integrated urban water management. The goal of this exchange is to facilitate peer-learning, accelerate technology transfer and innovation, and advance global progress on sustainable water management. 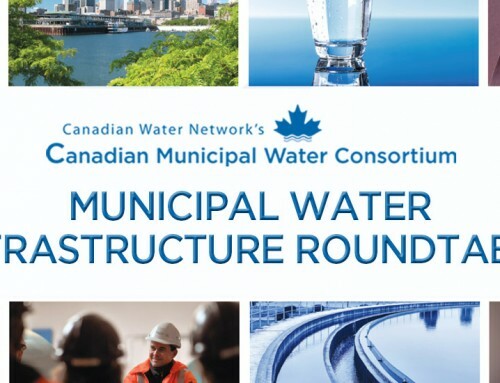 Upon their return, the scholarship recipients will share what they’ve learned with Canadian Water Network’s Canadian Municipal Water Consortium and the broader water community.